This tutorial will review the process of managing the product attributes on your website. By creating attributes, you will be able to provide a more detailed description for the products that you are selling on your website. To manage the product attributes on your osCommerce website, you will have to log in as administrator first. Click on the Catalog button at the left-side menu and then Product Attributes. The first option that you have is for creating product options. 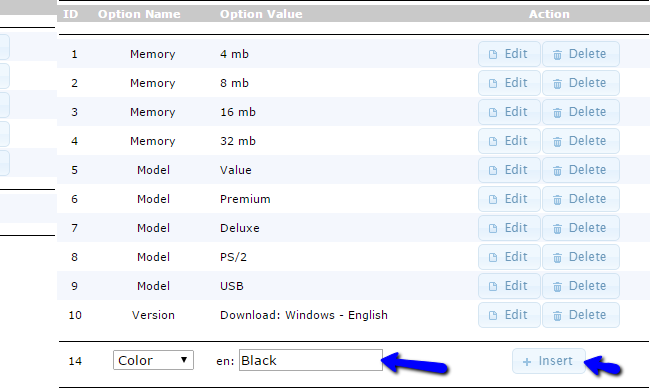 There are 5 pre-defined options, such as Color, Model, Size, etc. To create a new one, enter it’s name at the bottom of the Product Options box and click on the Insert button. You can also click on the Edit or Delete buttons next to the existing options to manage them per your needs. First locate the Option Values on the right-side of the screen. To create a new value, choose the option from the drop down box and enter it’s name. Click on the Insert button to add it. To manage the option values, you can simply click on the Edit or Delete button next to each one of them. To manage existing product attributes on your website, simply click on the Edit or Delete button next to each one.